Doll swimsuits are an easy handsewing project as they are made from a single piece of fabric with minimum seams. The instructions in this tutorial show how to fit a swimsuit on any size or type of doll, and give several options for changing the style of the suit. As shown here, the suit on this 7 inch tall Lottie doll is for a young girl, You can easily modify this style to add more of bustline for a fashion doll with a few front stitches. The doll is shown above with the basic tank swimsuit, which can be modified to have several different neck and shoulder lines, a swimsuit with an added removable skirt, and the skirt frill worn as a ruffle for an asymetric tank suit. How Much Fabric Do I Need for a Doll Swimsuit? Fabric for a doll swimsuit should be as stretchy as possible. Knits stabilized with lycra (elastic) or spandex are best, you can cut up an old shirt or swimsuit, find a small remanant of material to suit your doll, or look for fine knit fabric sources in the lingerie or baby section of stores. Most modern stretch fabrics will not 'run' or fray at the edges. You can use fray check or other fabric glues to hold edges of fabric to prevent them from fraying. The fabric will need to be cut so the stretch goes across the doll's body, rather than from head to toe. If your doll does not have a narrow waist compared to their hips or bust (like this Lottie doll), you may also be able to make swimsuits from only moderately stretchy fabrics, or woven fabrics cut on the bias to stretch across the doll's body. The fabric will need to stretch enough so that you can slide the swimsuit on and off over the dolls hips and legs. How Much Fabric Will I Need for a Doll Swimsuit? To make a doll swimsuit you will need a piece of fabric which fits over the doll as shown in the photograph. The fabric should reach from under the dolls arms to roughly her knees, and be slightly more than enough to wrap around the doll without stretching. Fine elastic thread, narrow elastic (depending on the size of the doll) or cord if you wish to tie rather than use elastic for the skirt/ frill. For my small dolls I use Elastic cord for jewelry like Opelon , elastic beading cord is available from bead supply stores, mine was 0.6mm cord. For very small dolls you may also be able to find fine elastic cord in the fly tying section of a sporting goods store. Crewel Needle, Crochet Hook, or Small Safety Pin to Thread Elastic Through a Casing. To begin fitting a swimsuit for your doll fold the top edge of your fabric down slightly and wrap the fabric around your doll's body with the folded edge under the arms. You should have one to two extra inches (2.5 -5 cm) at the back of the doll. Trim away any excess fabric more than a couple of inches at the back. Position the doll so the design of the fabric you want on the front of the swimsuit is facing the front of the doll as shown on the right of the photo. Make sure your fabric will stretch across the doll's body, instead of from top to toe. You will start by setting the fabric inside out on the doll. Lay your doll on the fabric so that you will be able to work on the back seam of the swimsuit to start. Hold your fabric at the back of the doll so the fabric is gently stretched around the doll, but not stretched as far as it will go. Beginning at the top of the folded edge, start making a row of back stitches down the fabric against the doll's body to make the swimsuit back seam. You can sew across your folded edge, or you can keep it free so it can be folded over after the back seam is stitched.Try to work so one edge of your fabric is straight and your seam is stitched in a straight line. If you have way to much fabric after you stretch it slightly, trim some off before you begin to sew your seam. Stitch all the way down to below the hip, at least the distance needed for the crotch of the swimsuit. Tie off your thread after the last stitch, or take several back stitches at the end to secure it. How to Trim the Back Seam of a Doll Swimsuit. Once you have finished sewing the back seam for your doll swimsuit, remove the fabric tube from the doll and use sharp scissors to trim the seam to 1/8 of an inch (3mm) or 1/4 inch for larger dolls. The thickness of your seam may also be determined by how easily your fabric frays or how thick your fabric is. Treat your fabric with fray check or fabric glue if necessary. Allow to dry. To mark the leg openings for the doll swimsuit, fit your swimsuit tube back on your doll with the folded edge under the doll's arms and the back seam running down the center of the doll's back. Use a pen or pencil , or tailor's chalk to mark carefully along the seam of the legs you can feel under the fabric. (see photo). Mark around the entire leg, taking care that your line is positioned on the seamline of the doll's legs. If your doll does not have moveable legs, mark the area where you think the top of the leg lies. Remove the marked fabric from your doll and fold it so the seam line is on one side. Trim the fabric below the marked curve for the leg, leaving at least an extra 1/4 inch of fabric below the markings as shown. Where the leg meets the doll's crotch, leave the fabric to run straight along the center back line and the center fold line as shown on the right of the photo. Fit the swimsuit back on the doll, still inside out, with the back seam down the center of the doll's back as shown. Carefully fold up the edges of your fabric along the leg lines, and use a simple running stitch to sew the fabric along the leg line openings. Take care to make the folded sections even, and don't allow them to bunch as you sew. Leave the crotch sections of the swimsuit free. When you are finished basting the leg openings you should have a suit which resembles the one on the right side of the photo on this page. Trim the excess fabric around the leg hems so you have between 1/8 inch (3mm) and 1/4 inch (6mm). Your basting stitches will be removed so they don't need to be particularly neat. With the leg seams evenly basted, decide if you want the crotch of your swimsuit to have a seam at the back of the legs or in the center of the crotch. For dolls with fixed legs it is easier to make the seam at the back. If your doll's legs will swing to the sides, you can make a center seam. Baste along the line under the doll's body to get the crotch seam in position as shown. Carefully remove the basted swimsuit from your doll and check that the leg hems appear to be the same on both sides of the suit. Use a fine needle and thread to make a fine hemstitch or slipstitch just inside your row of basting, close to the fold on the leg of the swimsuit. When you have stitched the hem to the suit, carefully pull out your basting stitches. Now use a backstitch to stitch along the basted crotch seam (if it is easier you can hem the leg openings before the crotch seam is basted, then fit the suit back on the doll and baste the crotch seam). Trim the crotch seam and finish any edges which might fray with fray check or fabric glue. Test Fit the Basic Tank Swimsuit to the Doll. Now for the moment of truth! Turn your swimsuit with the right (patterned) side of the fabric facing out. Carefully test fit the suit on your doll, checking to make sure the suit stretches evenly over the doll and fits nicely at the front and back of the legs. Make adjustments if necessary. For now, the extra fabric at the top of the swimsuit is simply folded to the inside. It can be used to make different bust and neck design details on the final suit. For my basic doll swimsuit I want to be able to tie a bow behind the doll's neck as her arms don't bend easily enough to fit arm openings into the suit. There are a number of different small trims I could use for this detail. They include ribbon, jewelry cord or fine braid, beaded trims, bunka cord, fairy lace and many other options. Pick one which will suit the style of your doll suit and be easy to tie. To make the neckline for your doll swimsuit decide which neckline shape you prefer. I am going to make a simple halter top to tie in the back, and have the center of the swimsuit go up slightly in the front of the doll. You can adjust the folded edge of your swimsuit to make scooped necklines, flat necklines or asymmetric shapes if you wish. Measure out a length of your trim which will run across the back of the doll swimsuit and up over the shoulders or around the doll's neck. Leave extra for a tie at the back of the neck if necessary. If your doll is difficult to fit, you could make an elastic ruffle as shown for the skirt and allow it to stretch over one shoulder of the doll. Lay your trim out against the doll dressed in the swimsuit. I have set my trim so it will cross over in front and tie behind the doll's neck. Begin sewing the trim to the top of the suit using tiny overcast stitches. Start sewing the trim to the suit under the doll's arm where your first stitches won't be noticeable. Adjust the fold at the top of the swimsuit to shape your neckline to your trim, keeping your overcast stitches behind the trim where they won't be seen. I used a contrasting thread to show you the stitches, if you use a thread which matches your trim they won't show on your swimsuit. Keep stitching your trim to the suit top until you reach the center of your suit front (for a halter neckline.) Leave the end of your thread on a needle, or at least leave it free without trimming or knotting it, and go back under the doll's arm to sew the trim across the back of the suit and around to the center front on the other side. Finish your stitching by joining the two sections of trim at the front of the suit. Make sure your suit front is even on both sides, then knot and trim your sewing threads. If necessary treat the ends of your trim or ribbon so it won't fray. Your finished basic tank suit should now resemble the first suit in the photo on the first page of these instructions. If you want an older fashion doll effect for your swimsuit, take a few stitches through the center front of your suit at the bustline to make a row of small gathers that will "puff out" the front of your suit. You can position a small button or a bow over the stitches to hide them and accentuate the bust if you wish. You could also top your suit with a ruffle to add a bust line. 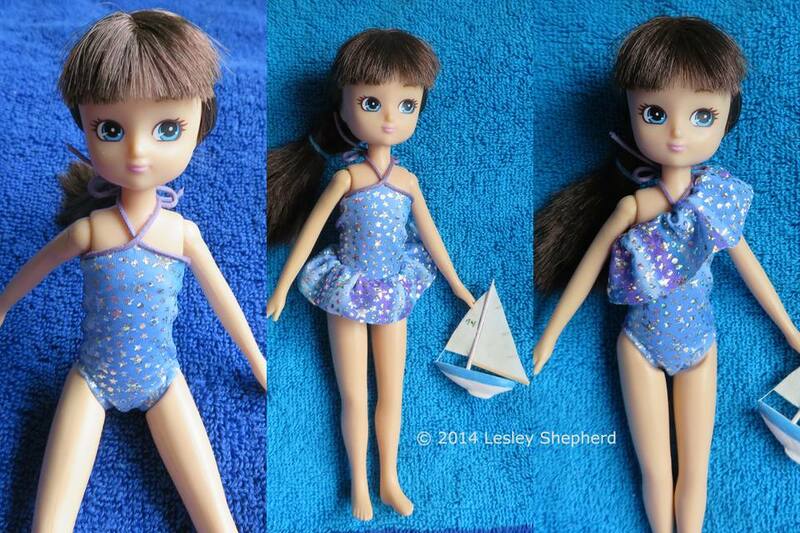 You can easily modify your doll swimsuit by adding an elastic ruffle or skirt to the suit. To make a ruffle or band, take a section of fabric or ribbon (the same or contrasting with your swimsuit) and cut it 1/4 to 1/2 inch (6-12mm) wider than you want your ruffle or skirt to be. You may need some extra width if you have to hem both edges. Make it a long enough strip to wrap 3 to 4 times around your doll without stretching. If you use stretchy fabric, the stretch should be across the width of the strip as shown, not from the top to the bottom. Turn the top edge down far enough to make a 'casing' or tunnel for an elastic thread or cord. Hemstitch or backstitch this folded edge in place across the entire width of the band. Test fit the band against your doll in the position you want your skirt or band to be. Trim the unfinished edge so it is even, and at the length you wish for your skirt or ruffle. When you have finished sewing the edge of the casing (tunnel) for your elastic, thread your elastic or cord on a darning needle or blunt tipped crewel needle to run it through your casing or pull it through with a crochet hook. You can also tie it to a small safety pin (which fits through the casing) and gently push the pin through the fabric 'tunnel'. Stitch your elastic to one end of your skirt / ruffle then pull on the other end to gently gather the fabric. You want your elastic to fit over your doll's hips for a skirt, but not so loosely that the skirt will fall off. For a shoulder ruffle you want the ruffle to stretch over the doll's head or arm to fit the suit on the doll. If you prefer to use cord to tie your skirt onto your doll, leave free ends of cord on either side of your casing so you can gather it to tie it on. When you have gathered your skirt / ruffle, tie off your elastic and sew the two ends of your ruffle to make a seam using a backstitch as shown. This will give you a gathered circle. You can slip stitch your skirt into position onto your doll swimsuit or use it separately by pulling it on over the suit. Trim the skirt or ruffle if necessary. You can easily add more beach accessories for your doll swimsuit. Lottie is shown here with an air mattress made from plastic drinking straws. She has a wooden sailboat carved from a scrap of craft wood or foam. You can make her flip flops or beach sandals that will fit any doll. You can even make miniature seaweed or a friendly seagull. Try making a miniature palm tree for a tropical beach. Have fun making custom accessories to give your doll a fun day at the beach.